This morning we are with Avon Energy Assessors Ltd at Welford on Avon in Warwickshire, we are here because the customer has reported that their laptop computer has slowed down and is not loading certain pages on Microsoft Internet Explorer and Microsoft Outlook was not sending or receiving emails. First we edited the registry and removed and unneeded programs from the machine amongst these are toolbar’s and recognised malware such as Babylon, Funweb, Yontoo etc. We then ran a Malwarebytes scan to check the machine and it found and removed further potentially unwanted programs (PUPS) . We also downloaded and installed PDF creator to allow the customer to create PDF files from any program that can print. Good morning, We are with a customer at Admington near Shipston on Stour, We are here because the customer has reported an problem with the speed of the computer being very slow. After checking we edited the registry, and removed Tool bars,Viruses and Malware from the computer system to effect a complete repair. Good morning, We are with a customer on the Shipston Road at Alderminster, We are here because the customer has reported an issue with the speed of the computer being very slow. After checking we edited the registry, and removed Tool bars,Viruses and Malware from the computer system to complete the repair. Nothing is more frustrating than a computer not working when you need it most. Doesn’t it seem like your PC always needs repair at the worst times? Perhaps your homework is due for a class or you simply cannot do the work you need to – whatever the case, getting your PC repaired is essential. Call us for a quotation on our mobile computer repair service ring mobile 07896 242565 or Local Call 01926 350906 . We Have over 29 Years of Experience in the computer repair service Industry and are able to offer advice and computer repairs as necessary to your requirements. We provide onsite maintenance, upgrades and computer repair services for all makes of laptops and desktop computers in the Coventry and Warwickshire area (including Warwick, Leamington Spa, Kenilworth, Stratford on Avon, Banbury, Southam, Wellesbourne, Kineton Bloxham and surrounding villages). 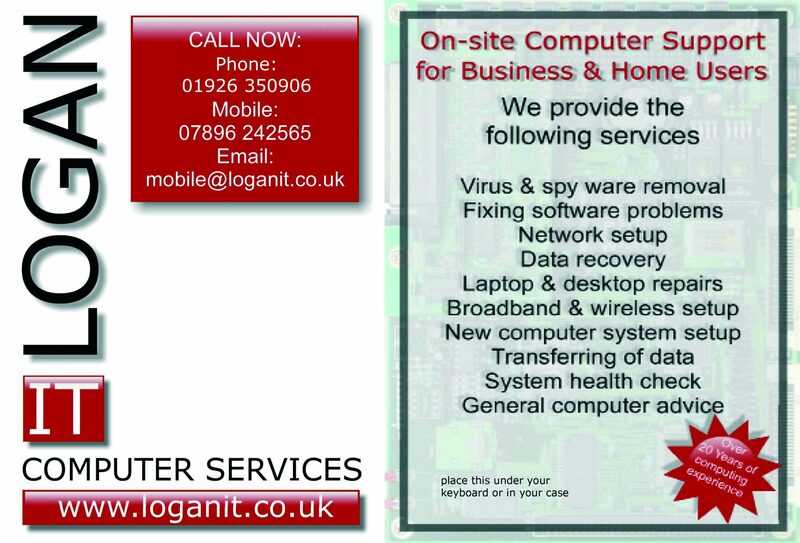 Logan IT perform on-site computer maintenance and computer repair services at your home or business premises in the city of Coventry and the county of Warwickshire (Including Warwick, Royal Leamington Spa, Kenilworth, Stratford upon Avon, Southam and surrounding villages). Virus Removal Service (Including Spyware Removal). Power Connector Sockets, Laptop Data Recovery, Reinstallation of Original Factory Setup). Network Problems Resolved / Setup. 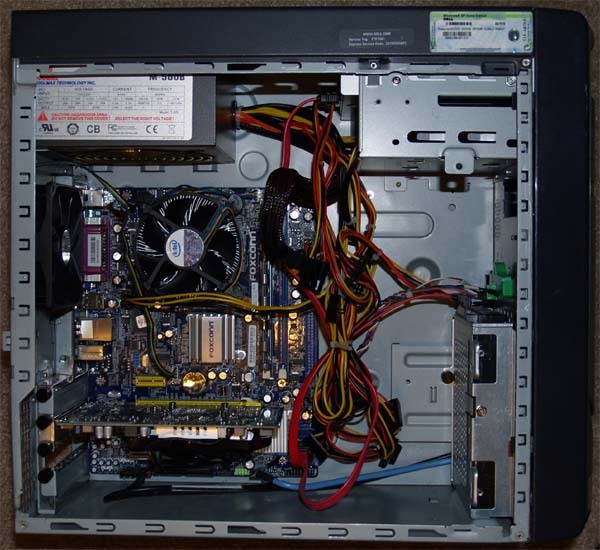 Desktop Computer Repair, Maintenance and Upgrade Services (Including Desktop Ram Upgrades, Transfering data and programs to SSD ( Solidstate Disk), Replacing Faulty Components, Desktop Data Recovery, Reinstallation of original Operating system (Factory Default Settings)). New Computer System Installations (Including data transfer from current / dead Computers). Broadband and Wireless Network Setup . Transferring Data from current or dead computers. Health Checks to make sure the computer is running correctly and when economical recommending upgrades. Call us for a quotation on our Onsite computer repair service ring Mobile 07896 242565 or Local Call 01926 350906 . Download a copy of our current Brochure. Good afternoon we are at Wasperton near Wellesbourne in Warwickshire with a customer to repair a Lenovo laptop computer and upgraded the antivirus Upgraded the BBC iPlayer and Adobe Flash to the latest versions and recommended that the Thompson Speedtouch 330 USB Modem is replaced with an up to date networked wireless router. Good morning we are with www.noflatbatteries.com at Leamington Spa in Warwickshire, we are here to repair sound problem with one of the companies computers, after fixing the issue on the computer we checked the companies website to see which pages need work for future optimisation. Good morning we are with Milverton Consultants on Milverton Terrace at Leamington Spa in Warwickshire, we are here to help the customer resubscribe to Symantec for Norton 360, whilst here we upgraded the Norton 360 from version 5 to version 6, and removed unneeded tool bars from Internet Explorer. Good morning we are with a customer in Kineton between Warwick and Banbury in Warwickshire performing general computer support and maintenance. Update: whilst here we also added Email accounts to another Apple iPhone, Apple iPad, Apple Macbook Pro and a laptop computer with Microsoft Windows 7. Good morning we are with a customer on Bridge End at Warwick in Warwickshire, we are here to repair the connection between the customers Brother multi function printer to scan correctly with the customers Toshiba laptop computer. For our last job today we are with a customer at Palmer road at Whitnash in Warwickshire, the customer has reported issues with their computer and we here to help. They have an email that wont delete and the www.telegraph.co.uk was not opening on Microsoft Internet Explorer 8. All repaired within the hour. Good morning today we are with a customer on Rouncil Lane at Kenilworth in Warwickshire, we are here to repair a computer that has a DVD-RW drive that is not working. Next today we are with Lighthorne Lamb at Lighthorne in Warwickshire, the customer is having problems with the internet at this location, this is traced to a Faulty BT Router which is reset for now but is quite old and will need replacing in the near future. Next today we are still at Kenilworth in Warwickshire with a customer on Kineton Road, we are here because the Customers Asus laptop is not working with the internet. Next today we are with a customer in Leamington Spa, we are here to check a LCD screen on a Samsung Laptop. Good Morning this morning we are with a customer in Leamington Spa to perform some general maintenance on the customers computers, and to place an SSD from a broken Laptop in to a USB caddie for use as an external storage. Good morning today we are with customers around Warwick performing computer repairs. Good morning today we are at a Customer in Southam to examine and perform an on-site computer repair on a desktop computer System. Update: this job Required a new power supply unit and a Trojan Virus plus some malware removed. This morning we are working for Pentastic Ltd at cubbington near Leamington Spa in Warwickshire to help repair a laptop computer, the fault with it is that the internet is not working on this machine. To repair this computer we reset the TCPIP and winsocks and cleared the internet cache files. We are now in Halford in Warwickshire at a customers to repair a non booting Toshiba laptop computer. Update to rectify this we went to the last system restore point which gave us a working computer, then reinstalled the windows updates one at a time with a reboot each time to make sure still working. This afternoon we are at a customers on Bridge End at Warwick in Warwickshire installing a Brother 620cn multifunction printer on a Toshiba laptop computer.